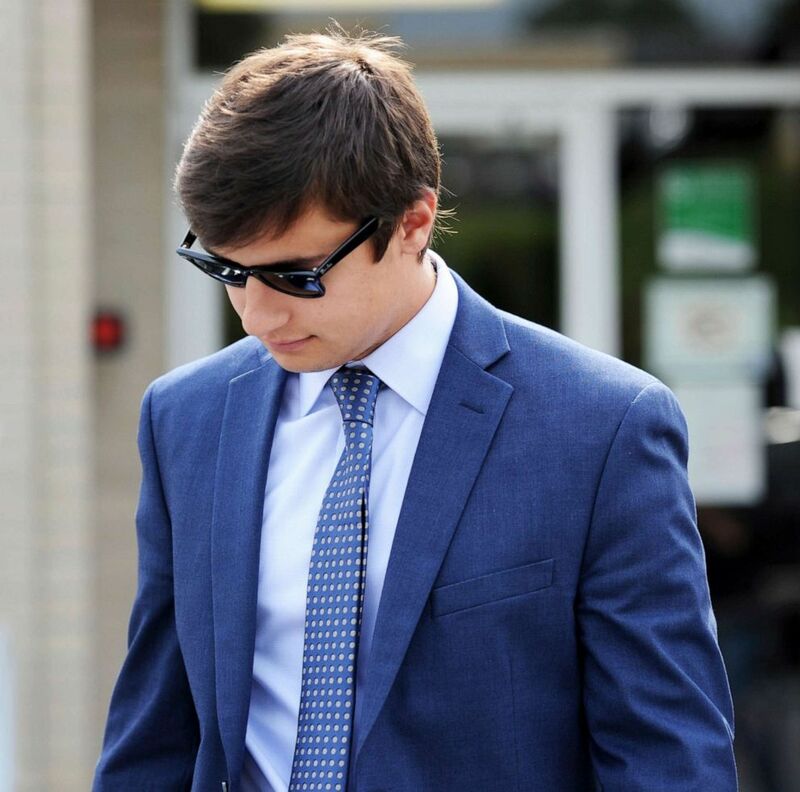 Four former Pennsylvania State University fraternity brothers have been sentenced in connection with the death of a pledge during a booze-soaked hazing ritual two years ago. Luke Visser, Joseph Sala, Joshua Kurczewski and Michael Bonattuci, former members of the Penn State chapter of the Beta Theta Pi fraternity, were sentenced on Tuesday by a judge in Centre County Court in Bellefonte, Pennsylvania, courthouse sources told ABC News. 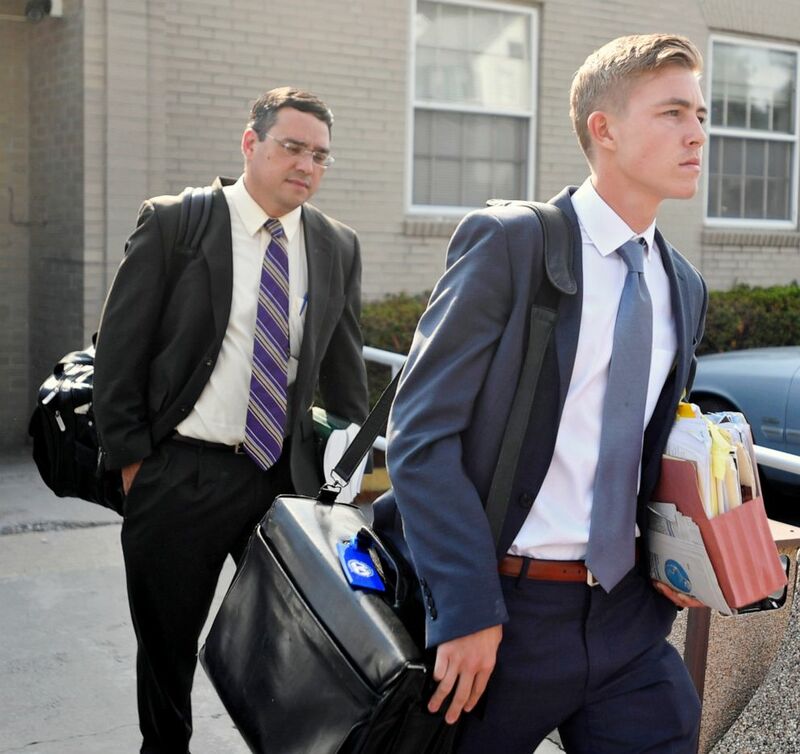 All four had previously pleaded guilty to hazing-related charges stemming from the February 2017 death of 19-year-old sophomore Timothy Piazza. "There's still a long road ahead of us," Piazza's father, Jim Piazza, told ABC News in an interview Tuesday. (Abby Drey/Centre Daily Times via AP, FILE) Beta Theta Pi member Luke Visser leaves the Centre County courthouse in this July 11, 2017 file photo in Bellefonte, Pa.
Visser received two to six months in jail and three years of probation. Sala was sentenced to three to 10 months of house arrest plus two years of probation. Kurczewski received to three to nine months in jail and one year of probation. Bonatucci was sentenced to one to six months in jail plus one year of probation. They also were ordered to pay fines and perform community service, sources told ABC News. It's the first time the judge has handed down jail sentences in the case, which was prosecuted by the Pennsylvania attorney general's office. 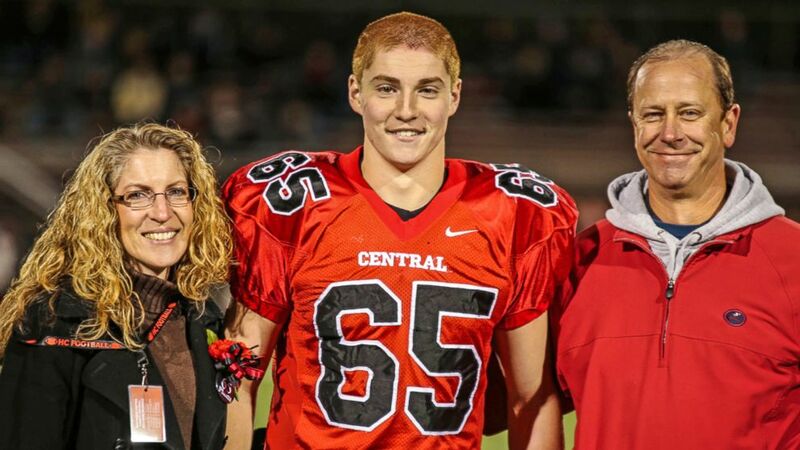 "Today was a significant step forward in the long road to justice for the parents of Tim Piazza with the sentencing of three individuals to prison," the Piazza family attorney, Thomas Kline, told ABC News in a statement Tuesday. (Phoebe Sheehan/Centre Daily Times via AP, FILE) Beta Theta Pi member Joseph Sala leaves the Centre County Courthouse in Bellefonte, Pa., after another day of prelims in this July 10, 2017 file photo. Piazza, of Lebanon, New Jersey, died from traumatic brain injuries Feb. 4, 2017, two days after he fell down a flight of stairs into the basement at the Beta Theta Pi fraternity during a night of heavy drinking for a pledge acceptance ceremony called "The Gauntlet." Fraternity brothers carried Piazza back upstairs and placed him on a couch, where they poured water on his face and slapped him in an attempt to wake him up, according to a grand jury report that cited evidence including surveillance video, witness testimony and phone records. Piazza tried to stand on his own but fell down each time until he eventually stopped moving. A fraternity member finally called 911, about 12 hours after the initial fall, by which time Piazza was breathing heavily, had blood on his face and his skin had turned grey, according to the grand jury report. In March 2017, the Beta Theta Pi fraternity was permanently banned from Penn State. The university said its investigation of the fraternity revealed "disturbing facts," including a persistent pattern of serious alcohol abuse, hazing as well as illicit drug use and sales. (Patrick Carns via AP FILE) Timothy Piazza, center, with his parents Evelyn Piazza and James Piazza in Flemington, N.J., Oct 31, 2014. After their son died, Jim and Evelyn Piazza helped form the Anti-Hazing Coalition with other families who have experienced a similar loss. The national coalition, which includes organization that represent dozens of fraternities and sororities, is fighting for new legislation to increase criminal penalties. In October, the Piazzas joined Pennsylvania Gov. Tom Wolf at the signing of the Timothy J. Piazza Anti Hazing Law, which requires schools in the state to help prevent hazing, to provide law enforcement tools to address hazing and to hold abusers accountable. "There's still a lot that needs to occur in regards to Tim's killing," Jim Piazza told ABC News on Tuesday. "There's a lot to be seen." ABC News' Henderson Hewes, Jessica Mendoza and Emily Shapiro contributed to this report.